Justice Department announces Newark police reforms agreement. 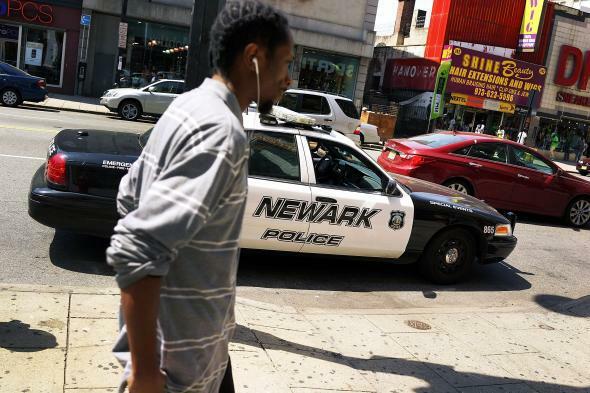 A man walks by a police car in downtown on May 13, 2014 in Newark, New Jersey. After a three-year investigation into the policing of Newark, New Jersey, the Justice Department announced Wednesday a series of sweeping reforms aimed at stopping unconstitutional police practices in the city. The DOJ investigation found that the Newark Police Department routinely made unconstitutional stops, searches, and arrests, and employed excessive force, even theft. The federal review was triggered by complaints lodged by the ACLU about policing in the city; the DOJ found that police targeted minorities when making stops and a whopping 75 percent of pedestrian stops were considered unjustified. The Justice Department has launched similar civil rights investigations into policing practices in Ferguson and, more recently, in Chicago.